Since it's large enough to successfully kill at a range of 50 yards or more when used in a 12 gauge shell, #5 lead shot is a very popular and widely used load for pheasant and duck hunting around the world. The number of pellets in the shot can cover a nice 10- to 15-inch diameter of kill zone at this range (after patterning), and penetrates up to twice as much as steel shot of the same size. And while you can get #5 shot with softer, denser pellets that penetrate better, or harder “magnum” pellets that will give you a more uniform spread – you will lose a little power. Most boxes of #5 will have a pheasant on them, which is the first clue for its primary use. Giving plenty of penetration, this ammo allows you to hit pheasants on the run that dart behind bushes and other foliage. It also gives quite a bit of velocity, making it just as ideal for hitting flying ducks as well. 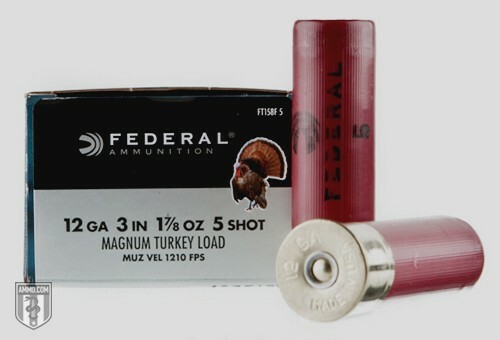 Duck and turkey hunters have great things to say about this ammo type for game bird and small critters like squirrels. The key advantage is the higher pellet count, which averages about 170 pellets when compared to 135 in a one-ounce load of #4 shot. #5 lead is a nice choice for backyard clay shooting, though some prefer steel for this particular application. It can depend on where you live and how you feel about using lead shot. If you have a well, you might opt for steel as a regular shooter. Target shooting with #5 can be a lot of fun and it can also help you determine things like the maximum effective range of your shotgun, different choke settings, and different shell sizes. All of these factors can make a significant difference in your approach to shooting, and can give you an excellent feel for what ammo is best to hunt with. #5 lead can penetrate into ballistics gel from between two to four inches at 10 to 20 yards, and over an inch at 50 yards. Any trespasser, be it human or animal, will be stopped at close range. Small, far-away animals may be killed, but this can depend on your familiarity with your weapon. For home defense, anything classified as bird shot might not be your first choice, as it does not penetrate as well as heavier shot, such as 00 buck. #5 lead shot is a versatile shot, but as with all ammo, make sure lead is okay to use where you plan to hunt, so you don’t walk away with a hefty fine.